Today the Saints were playing the Indianapolis Colts (and won 27-21). The game started at noon and I have folks coming over for dinner, so I decided to pull out my Crock Pot and let it do the work while I enjoyed the game. This recipe started from one I saw on Make, Blog, Repeat a while ago. I’ve experimented with amounts and have decided the ham really needs a brown sugar/cinnamon coating and that the applesauce was less salty if a bit of apple cider is added at the beginning of the cook time and some cinnamon/brown sugar added in the final cooking of the applesauce. Give it a try yourself and tell me what you think. Slather the bottom and the lower third of the crock pot with butter. Sprinkle 1/4 cup of the brown sugar on the bottom of the slow cooker. Score the ham with shallow gashes in a diamond pattern. Place in the slow cooker. Combine the remaining 1/2 cup of brown sugar and the cinnamon in a bowl and mix well with your fingers. Press the mixture to the sides and top of the ham. Peel and quarter the apples, placing them in a bowl of water with a bit of lemon juice to keep from browning. Dice the apples into the slow cooker. Pour in the apple cider (trying not to pour directly over the ham and taking off the brown sugar coating). Cover and cook for about 5 hours on low or 2 hours on high or until the internal temperature of the ham is 160 degrees F.
Remove the ham from the slow cooker and allow to rest before slicing. Strain apples from the juices and place in a small saucepan. Use a fork (or potato masher) and up to 1/2 cup of water to get them to desired applesauce consistency. Stir over medium heat. Add additional cinnamon and brown sugar to taste. If you want to make them more tart, add a little bit of lemon juice. Stir well and remove from heat. 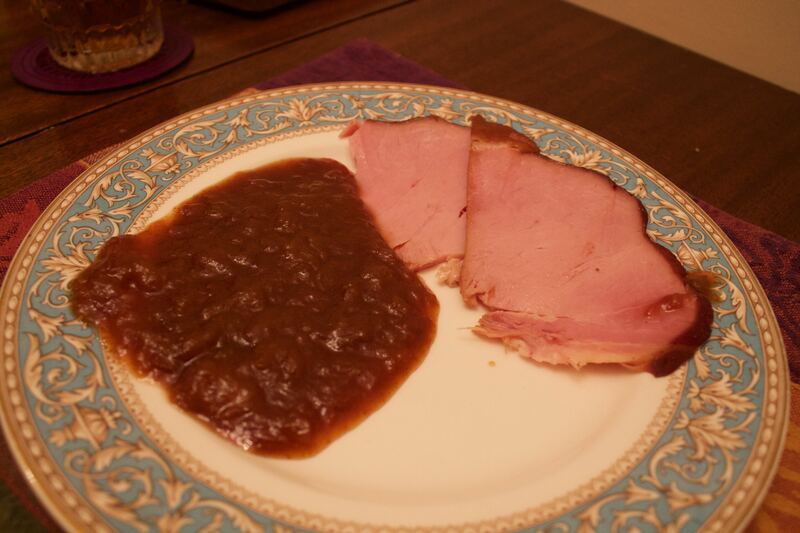 Serve slices of ham with the applesauce. An alternative ingredient to throw into the mix which could replace / augment in a couple of different ways: ground up gingersnaps, whatever your favorite kind is (we like ones that have more kick to them). We coat the ham with ordinary yellow mustard, then pack on the crumbs. I typically do a root beer glaze on my baked ham (https://mouthbrothels.wordpress.com/2013/05/11/old-school-root-beer-glazed-baked-ham/) but I figured adding any of the usual would put off flavors in the applesauce. I think I may try gingersnaps the next time I do one in the oven – it sounds delicious.